Welcome to Diane Lenning's website. Here you will learn more about Diane Lenning and what she's currently involved in. This site will also remain available as resource information for those interested in a Republican view on public education. WRITE IN "Diane Lenning" for the November 2, 2010 election. Listen to Diane's radio advertisement (from the June election). Diane LENNING is the ONLY Republican Candidate who qualifies as a "WRITE-IN"- November, 2010 for CA Supt of Public Instruction! No Other Name will be counted, even if written in! This is a "SECOND CHANCE" and real opportunity for Republicans and all Conservatives to gather around a "genuine" Republican and real "tea party" candidate. Here is what Joni Ludwiczak wrote about DIANE. "I think Diane Lenning is a real find for this office, and I'm specifically asking you, before it's too late, to please encourage all your contacts to vote for her, as I'm doing -- for it's the strength-in-numbers where the TEA Party will make the difference. If we're divided, we're not as effective..."
-- She is a third-year law student, having entered law school "in order to stand for the Constitutional rights of Americans"
-- She won the Medal of Freedom, given to her by the U.S. Senate in 2004 "for her political analysis, talking points, and activism"
-- She is a Constitutionalist, who wants to require students to pass for high school graduation a "civics and government" test which would teach the U.S. Constitution and founding documents and who has written a book, entitled "Call of the American Dream," where she encourages every American to get a copy and memorize the Constitution; she even passes out Constitutions from time to time along the campaign trail! -- She is a descendant of Thomas Benge (b. c. 1760 or 1780 in Albermarle, VA), who married Susannah Lewis, George Washington's niece, in 1773 and served in the American Revolution from Abermarle/Orange County, VA. She is also a descendant of Thomas Benge's ancestor, William J. Benge, who came from Kent, England on the ship Marygold to Jamestown, VA.
-- She undoubtedly has the same patriotic, Christian passion that we in the TEA Party have in order for her to make a real patriot impact in the lives of the massive numbers of immigrant youth we now have in our nation today, legal or otherwise. So, please, I hope you'll strongly consider throwing your political clout and influence behind Diane LENNING for State Superintendent of Public Instruction before it's too late -- and inform your contacts to vote for Diane Lenning. In your own words, TOGETHER WE can make a difference!" Please forward this information to everyone you know! NOW is the TIME to work TOGETHER to elect a quality candidate for all our kids and grandkids! Tell all your friends to "WRITE-IN" DIANE LENNING this November for CA Superintendent of Public Instruction next to the office for Supt of Public Instruction. Hopefully, there will be a blank space for "write-in." Thank you so much for this opportunity to serve you! Together we can make a difference! Do you believe it's time to fix our schools in CA, ushering in a "cultural reformation" in education? Yes, Diane Lenning, Ed.M. should lead in fixing our schools in CA. Diane is focused on providing A high-quality education for all young people of California. It is the "civil rights issue" of this generation! 10 POINTS to a Quality Education to "fix" our schools! 1) At the TOP of the list is to "reduce the school drop-out rate," and increase the graduation rate; providing a quality education and a bright future for every student. "DROP-OUT PREVENTION IS CRIME PREVENTION!" It's time to SAVE $1.1 Billion a year by educating drop-outs under age 18. 2) Provide vocational and technology programs for students who want a job right out of high school. Centrally located Regional Occupation Programs will provide skills for students to get a job rather than go on welfare or commit crimes. 3) Assure safe schools for a rigorous and high quality learning environment, closing the "achievement gap" between minority students and English only students. Two police on every high school campus will curb crime on campuses and provide a quality learning environment for higher student achievement. 4) Sub-divide overly large districts that fail to manage their districts in an economically and educationally successful manner to bring more local control to school districts for student success; bringing more money to the classrooms where the funding is needed the most. "Mid-size" districts assure better oversight and management of education programs through "local control," bringing local neighborhoods together around their centrally located schools. 5) Use the ideas that have demonstrated success such as from the national Eli Broad Award winning district where I taught for 15 years, and contributed to the success of student achievement and closing the achievement gap, where students engage in rigorous curriculum, i.e. English immersion, pacing, quarterly benchmark testing, timed intervention (RTI), summer school after two specified grade levels for students to reach grade level skills, and mandatory tutoring for failing students, etc..
7) Assure "Back to Basics! "...academic focus on core curriculum courses for student success, and provide enriching courses for elective classes such as ROP vocational classes that count toward a diploma. ROP classes in areas such as truck driving, florist, animal care, computer technology, merchandising, child care, beautician and skin care, and many others, will prepare our young people for jobs right out of high school, and will count as credits toward a diploma. 8) Require students to pass a "civics and government" test in order to graduate; passing the "torch of liberty" to each generation. Include an American flag in every classroom. Provide Leadership training for our leaders of the future! 9) Considering performance based pay to attract high quality teachers using "multiple measures" using a point scale, not just one criteria; from a list of approximately ten criteria such as higher degrees, school board member, department chair, elected union leader/delegate, local district professional boardmember, district committees/consortiums, site council, college professor at night, student performance, coach, club advisor, and school to community/business liaison for student job placement. 10) Quality district/school administrators and principals who lead with school-wide discipline and curriculum plans to bring success to every classroom; supportive of teachers in the education process. Providing mandatory parent orientation meetings each fall with published pamphlets listing teacher, student, and parent expectations and goals, working together to assure students become engaged in rigorous learning environments. Tom and Larry:...someone recently characterized as "the two deceitful guys who dance for the union leaders." Larry Aceves is NOT a Republican and he is NOT endorsed by the Republican Party. 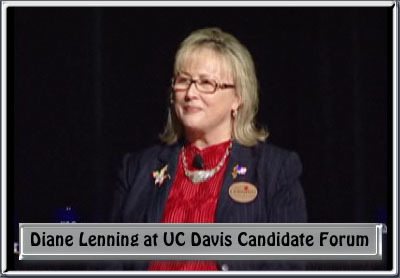 Diane LENNING is the ONLY Republican candidate endorsed by Republicans. Larry's union leader friends and special interests groups have spent over a million dollars to buy up Republican slates to pass himself off as a Republican because they know he is a mediocre leader of a small failing school district, and can only win as a "phoney" Republican. That's how he did it in June! He even stated his district "had too many old white teachers!" DON'T BE FOOLED! These slates are owned by PRIVATE business owners who don't care who they take their money from! As long as they get their money, they don't care about principals. Money trumps truth or ethical business practices! 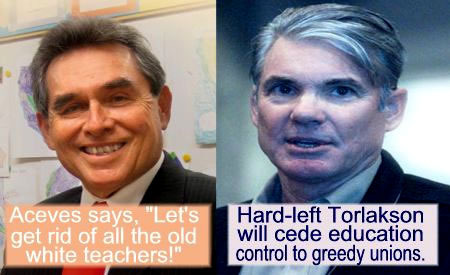 Tom Torlakson is a "termed out" legislative member looking to continue feeding from the trough. He has "yesteryear" experience of teaching many years ago. He wrote his ballot designation as a teacher and legislator. How can he be a "full-time" teacher for the previous year as required if he has been in the legislature for over 18 years? HIs ideas are outmoded and out of touch with the modern strategies and methods of education. He will be the face of the union leaders in our schools, smothering the voice of parents and families! Diane Lenning has been an educator for over thirty years! She has been a contributing teacher in her district that won the Eli Broad Award for most improved student scores in the nation. Diane knows how to close the achievement gap, reduce the "drop-out" rate, provide safe schools, teach the Constitution with an American flag in every classroom, and bring back vocational education to help our kids get a job right out of high school! My name is Mrs Lenning, teacher for over thirty years in Los Angeles and Orange County public schools. I also taught young men in the California Youth Authority. I worked with gang members and at-risk students much of my career, teaching English Language Learners, resource students, and mainstream students. There are no surprises for me in what it takes to help our young people succeed in school. I know exactly what to do to fix our schools. Providing a safe school environment will improve attendance and reduce the school "drop-out" rate. Improving curriculum and providing tutoring will help our students get a quality education and pass the high school exit exam, improving graduation rates for students who will earn diplomas. High school graduates do better in life, and provide better for their families. Bringing mismanaged school districts into compliance will assure better management of school funds and resources. I want accountability in education just like you do. Quality teachers, administrators, and support personel are important for a good education for our kids. In order to make sure our kids get a quality education, I will need your help. Please help me today by joining my team and contributing to my campaign. $10, $25, $50, or $100 will go a long way to assure our kids get the education they deserve. Buenos Dias. Mi Nombre es Diane Lenning, profesora de hace más de treinta años en los colegios de enseñanza publica de los condados de Orange y Los Angeles. Durante este tiempo también he enseñado en el "California Youth Authority". Durante mi carrera como educatora he trabajado con pandilleros, tal como estudiates en riesgo, éstos tambien en programas de aprendizaje de inglés. Para mí, no habrá sorpresas como correjir y ayudar a niños en el aprendizaje. En corto, se exactamente como arreglar nuestro sistema escolar. En proporcionar una jornada escolar sin riesgo, mejora la asistencia del pupilo con lo cual mejora la educacion en general, y el éxito particular en los examenes estatales de grado mejorarán sí mejoramos el currículo. Está comprobado que estudiantes que se graduan de la enseñanza media tienen mas éxito al largo plazo y proveen mejor para sus familias en sus futuros. Solo mejorando la concurrente mala gestión del sistema escolar podemos adelantar el manejo de los recursos y fondos procedientes del estado, y esto significa un adelantamiento de la calidad de los administradores, profesores y educadores de nuestros niños. Con el fin de asegurarnos de que nuestros niños reciban una educacion de calidad necesito su soporte. Ayúdeme por favor con una donacion para mi campaña electoral de $10, $25, $50 o $100 para asegurar que nuestros niños reciban la mejor educación posible. 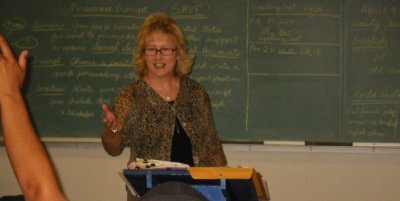 Muchas gracias por su apoyo, y recuerde votar por Diane Lenning por Superintendenta de Instrucción Pública de California en junio del 2010! Media: 562-596-4825 Please leave a message. P.O. Box 4306, Huntington Beach, CA 92605-4306.